May I present my 6threport to the electors of the Parish, as Chairman of the Parish Council? As with my previous reports, and, indeed, those of my predecessor, the dominant subjects are planning and transport. These matters have taken up most of your Council’s time during the past 12 months. I mentioned the National Planning Policy Framework (NPPF) last year. This was established by the Government a handful of years ago, to sharpen up the planning and development control processes, which were deemed to have been ponderous and, at the bottom line, not favourable to the development of housing. It will probably not surprise you that the NPPF is now felt not to be expected panacea for all ills, and is, itself, under review – the Government is consulting on changes. You may rest assured that your Council will keep a close eye on what is proposed. A fundamental perceived problem with the NPPF is that it is not helping meet the growth in demand for housing, especially in London and the South East. There are, of course, sceptics who would say that the planning system itself will never meet the demand, because speculators understandably require a profit, and there is precious little to be made producing truly affordable homes, where, it is often argued, there is the greatest demand. In any event, what can one describe as “affordable” in this Parish? However, the demand for housing is fuelling possible major developments just over the boundary of the Parish, and in the Parish itself. I mentioned last year the applications for 95 houses on land off Kennylands Road, in Sonning Common, and for 245 houses on land at Bryants Farm, Emmer Green, in the Parish of Eye & Dunsden. Both of these applications were turned down by the District Council. Both are now the subjects of appeals to the Secretary of State against the local decisions and will be heard at public inquiries in Henley later this month and early next. Your Council will consider later this evening whether to support financially the Campaign Against Gladman in Eye & Dunsden (CAGE), an organisation which intends to be represented at the Bryants Farm appeal. 2 alternative applications for 10 or 14 houses at The Elms, Tokers Green Lane, Tokers Green, in the Parish, were also turned down by the District Council last year. Again, the applicants intend to challenge that decision, but the arrangements for the appeals have yet to be announced. There is also, of course, the spectre of the possible development of the Reading Golf Club. You will know that part of the course lies in the south of the Parish, and the land was submitted as a possible development site to the District Council, during preparation of the District Council’s Strategic Housing and Employment Land Availability Assessment. It is recorded in that document as being available, achievable and sustainable, and capable of delivering c450 houses. However, your Council has been reassured by the District Council’s Planning Officers, who have stated that the Golf Club land is not included within the current emerging Local Plan because it did not meet the requirements of the District Council’s spatial strategy. The Officers also indicated that no planning application or pre-app advice has yet been sought by the owners or potential developers regarding this site. Nevertheless, the potential development presents a real concern, and your Council is keeping a close eye on the matter. All of these pressures led your Council to decide, after a well attended public meeting in Gallowstree Common in July last year, to support and facilitate the drafting of a neighbourhood development plan (NDP), for the whole Parish. A Steering Group has been established, from expressions of interest given at the public meeting, with representation from most of the settlements in the Parish. I am the Chairman of that Group. The District Council has approved the plan area – we had to exclude some small parcels of land on the boundary with Sonning Common, which had previously been included in the Sonning Common NDP, with the consent of your Council. The Steering Group held some public sessions in February, as a result of which it is presently framing a consultation questionnaire to be delivered to every household soon. The results of the survey will clearly be crucially important to the plan, which will, in any event, be subject to a referendum of all electors in the Parish in due course. The Steering Group has, incidentally, already discovered that the District Council will only accept proposals to develop land in Kidmore End village, because that is the only settlement in the Parish deemed to have the infrastructure to sustain further development … There will be a call for possible sites soon. May I take this opportunity to thank, on your behalf, all those residents who have stepped up to the mark in order to make the compilation of a NDP a successful venture. Our NDP will have to conform to the South Oxfordshire Local Plan. It was expected that that a new Plan would be adopted for submission last month. However, the District Council rejected the draft presented to it by its officers. In this connection, it is worth noting the steps being taken by central Government against local planning authorities yet to complete a “modern” local plan. Councils which fail to comply with the requirement run the risk of losing their powers to determine planning applications, that role being exercised instead by inspectors appointed by the Secretary of State. Given the high profile cases locally determined by inspectors, for example Thames Farm, this would not be popular, and would fly in the face of the concept of localism which drives NDPs. Planning applications are determined against the NPPF and the present Local Plan. Your Council has been invited to comment on 43 applications in the year since the 2017 Annual Parish Meeting. This is identical to the figure for 2016/17. The applications have been for the usual fare of house extensions, but, as mentioned above, there have been more than the customary number of applications for new dwellings. For the most part, the District Council, the planning authority, acknowledges our comments on the applications, and reacts accordingly. There have, regrettably, been a couple of notable exceptions, however, where your Council have favoured refusal but the District Council has granted permission. Turning to planning appeals, there have been 3 relating to the Parish determined in the past year. All 3 were dismissed, and related to possible new houses in Horsepond Road, Gallowstree Common. In addition, the District Council made, and, subsequently, confirmed a tree preservation order relating to some individual trees, groups of trees and woodland at The Elms, in Tokers Green. The Council has been pursuing its ambition, to secure the inclusion of the whole of the Parish in the Chiltern Area of Outstanding Natural Beauty, during the year. Achieving this would ensure a regime of planning restraint throughout the Parish. Unfortunately, this seems no nearer to a successful outcome than it was in my report last year. As I said earlier, the other significant issue over the past year has been the roads and traffic in the Parish. Your Council proceeded to commission the reduction of the speed limit in Kidmore End, as the statutory authority, the County Council, was prepared to make the necessary traffic regulation order, provided that the Parish Council paid. The order was made and advertised last summer. The vast majority of those who responded to the consultation supported the proposed reduction in the limit, but there were those, including a couple of residents of the Parish, who opposed it. In the event, the relevant Cabinet Member of the County Council agreed to the order being confirmed. The signs were finally erected last month, and the new speed limit can be enforced. Your Council has no statutory power to spend money on things like speed limits, but was able to use a discretionary power. The total cost of the exercise, net of VAT, was £4,895, which represents £7.35 per Band D household. The speed of vehicles on roads in the Parish remains a particular issue, especially in the Horsepond Road, Gallowstree Common. Residents of that village argue that many vehicles pass through it at speeds above the speed limit, 30 mph, despite, for instance, the vehicle activated speed indicator device installed at the request, and expense, of your Council a few years ago. We have asked for the support of the Thames Valley Police in tackling this problem. Residents of Tokers Green have also drawn attention to apparent speeding in Tokers Green Lane, in that settlement. Your Council recognizes that much of the traffic in the unclassified roads in the Parish is generated by there being a successful primary school in Kidmore End. Parking associated with the School remains a perennial concern, and your Council has engaged the School authorities and the Police about this. That said, there is no easy resolution to the issues, because the School is an important part of the infrastructure which helps to ensure a vibrant village and Parish. There are other perennial concerns about the roads in the Parish, which have been amplified by the more extreme weather conditions we have suffered over recent months. Pot holes are rife. Some roads in the Parish are deteriorating fast, having started the winter in poor condition anyway. Flooding and puddles are also an increasing problem, particularly in Tanners Lane, Chalkhouse Green. 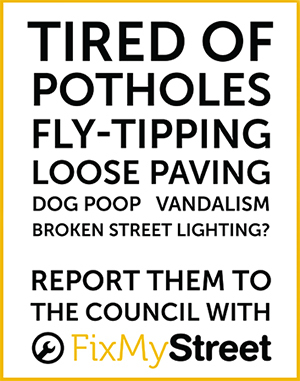 Your Council notifies the County Council’s Area Highway Steward of road damage and flooding, but, frankly, it would help immeasurably if individuals reported defects they see to the County Council direct, via the FixMyStreet link on the County Council’s website – and even easier if you download the app. This is for 2 reasons. The first is that the earlier the defect is reported, the sooner it is likely to be rectified. The second is that the highway authority has no legal defence, when a claim is submitted, if a defect has been previously reported to it but has not been repaired. Your Council took over the maintenance of highway verges, in the Parish, with the exception of the A4074 road through Cane End, last year. Following a tendering exercise, a contractor located in the Parish, Ian Kendrick Ltd, secured the contract. Your Council was very pleased with the performance of the contract last year, and is delighted that the Company will undertake the work again this year. What pleases the Council most is that it can adjust the timing of cuts relatively easily, responding to growth, rather than be at the mercy of a juggernaut, county-wide, contract. It is important to note that your Council does not, however, have any duties in respect of roadside hedges. These are the responsibility of the owner or occupier of the land on which they grow. If hedges start to impede use of the road, please report them to the County Council using FixMyStreet, as mentioned above. Compared to the roads, the footpaths and bridleways etc in the Parish are in relatively good order. While your Council has no statutory responsibility for them, there is a Council sub-committee which keeps the paths under review. That said, byway 26 – the extension of Chalkhouse Green Lane from Chalkhouse Green to the County boundary at Emmer Green – is in a parlous state following the wet weather of the winter. Your Council has referred its almost impassable condition to the County Council, which has responsibility for footpaths etc. Your Council completed the refurbishments of both play areas during the last year, for instance, by replacing the equipment bark pits with a more sustainable safety surface, and replacing the major item of equipment at Gallowstree Common. This was an expensive venture – nearly £47,000 net of VAT, but the cost to the Council Tax payers of the Parish was limited to just over £9,500, the bulk of the cost being met by grants and donations totalling over £37,000. Your Council also owns the wells at Gallowstree Common and Kidmore End, and the ponds at Kidmore End and Tokers Green. It was necessary to replace the finial cross on the well house at Kidmore End during the past year – how it came to “fall” off remains a mystery – while the posts and fence around Kidmore End pond will be repaired in its south eastern corner, following the removal of invasive vegetation. The Vice-Chairman, Caroline Aldridge, and I try to keep the withies around the pond under control, annually. I regretted last year the loss of some of the “softer” infrastructure in the Parish, like the mobile library. The FISH Volunteer Centre eventually decided to withdraw the bus service it provided in replacement for the former M1 service, largely because patronage was low to non-existent. One can still take advantage of the FISH transport facilities, but there are no longer any Kidmore End specific journeys. Unfortunately, use it or lose it was only too true in this instance! Following their decommissioning by BT, the Council owns the 3 remaining former telephone kiosks in the Parish. There used to be a fourth kiosk – in Gallowstree Common – but that was not replaced following acts of vandalism many years ago. The Council is engaged in the repair and renovation of the kiosks, under the direction of Mr & Mrs McAslan of Kidmore End: the McAslans are repairing the door of the Kidmore End kiosk as we speak, that kiosk having been moved and reoriented by my colleague councillors, Trevor Perchard and Hugh Thresher, during the summer last year. The Council will have extra funds to help improve the infrastructure in the Parish as the years go by, as it will receive 15% of the Community Infrastructure Levy raised by the District Council from new houses built in the Parish. That percentage will rise to 25% when the NDP is adopted. Your Council will, I expect, canvass your views as to suitable projects, in due course. On the subject of infrastructure, BT and Better Broadband Oxfordshire are slowly extending the network of fibre optic cables in the Parish, to make better Broadband speeds available. Following reaching Kidmore End and Gallowstree Common in 2016/17, further progress has been slow, because of the need for a number of wayleaves for electricity supply for cabinets etc. However, it looks like the cabinet in Chalkhose Green will be connected soon, if the cable laying works in Chalkhouse Green Road (requiring an unfortunate road closure) are successful. Tokers Green should be connected later in 2018, although a closure of Tokers Green Lane will inevitably be required for the fibre optic cable laying operations. All of your Council’s activities are funded from the Council Tax, collected by the District Council. The Parish Council’s element of the Tax was £54.10 in 2017/18 for an average (Band D) dwelling – just over £1 per week. As you will have seen from your bills, recently received, the Council’s element of the Tax has risen to £55.18 for 2018/19 for the average dwelling. This is very much below the average parish or town council precept across South Oxfordshire, which is £86.62 per year. I hope you will agree with me that this represents excellent value for money. Much of what I have said above has been reported already in the Parish Newsletter or on the website. In this connection, I would express my gratitude, on your behalf, to the Newsletter editorial team – Caroline Aldridge, Sheila Forde, Andy Miros, Ana O’Reilly and Jackie Russell (together, of course, with distributors!) – and to the webmaster – Ana O’Reilly, who took over from David King during the course of the year. Ana has been instrumental in revamping the website, and for devising our logo – representing the well at Kidmore End: the Council has not had a logo since its inception in 1896 until now! There has been one change of personnel at the Council during the past year. Sarah Hunter resigned as a councillor last month, for family reasons. The vacancy has been advertised: if no election is claimed, the Council hopes to fill the vacancy by co-option at its May meeting. If you are interested in serving as a councillor, please contact our Clerk, Roger Penfold – clerk@kepc.info. At the next quadrennial elections, in May 2019, the number of parish councilors will reduce to 10 – it is presently 12, but there have not been 12 councillors in post since the summer of 2015. I should like to thank my fellow councilors for their unstinting support for you and the 5 communities in the Parish over the past 12 months. They are all volunteers, receiving no payments whatsoever, unlike their counterparts at the County and District Councils. They are vital to help sustain the buoyant communities in the Parish.I should also like to thank the Clerk to the Council for his wisdom, knowledge and support for the Council over the years.